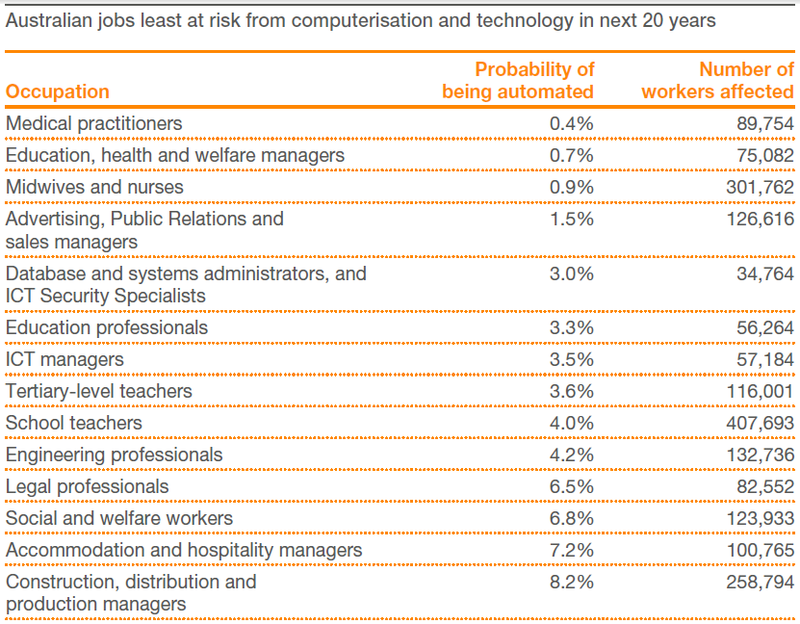 A recent report by PriceWaterhouseCooper predicted that 44% (5.1 million) of the jobs that exist in Australia today are at risk of ‘digital disruption’ by 2035. PwC predicts that computerisation and technology will not only create new jobs in the next 20 years but will ultimately supersede much of the existing workforce as well. In order to realise our full potential, Australia needs an appropriately skilled workforce; a workforce fit for the future. PwC has concluded that expanding our STEM industries (Science, Technology, Engineering and Mathematics) would maximise economic outcomes for Australia in the next few decades. The Australian economy has benefited greatly from economic reforms and from increasing demand for natural resources, mostly from China, which drove most of Australia’s growth in the early 2000s. At the same time, the PwC report says, economic growth from productivity has halved and Australia needs to develop a strong STEM foundation to guarantee economic growth after the current commodity boom has finished. Download the full PDF report from PwC here. While it’s important to choose a future-proof career in one of the fields above, the benefits of doing so extend far beyond the individual level. PwC has predicted that Australia could gain a $57 billion economic boost between 2015 and 2035 if it switched just 1% of its workforce into STEM occupations. Australia’s prosperity in the next few decades appears to be highly dependent on our nation’s commitment to STEM. 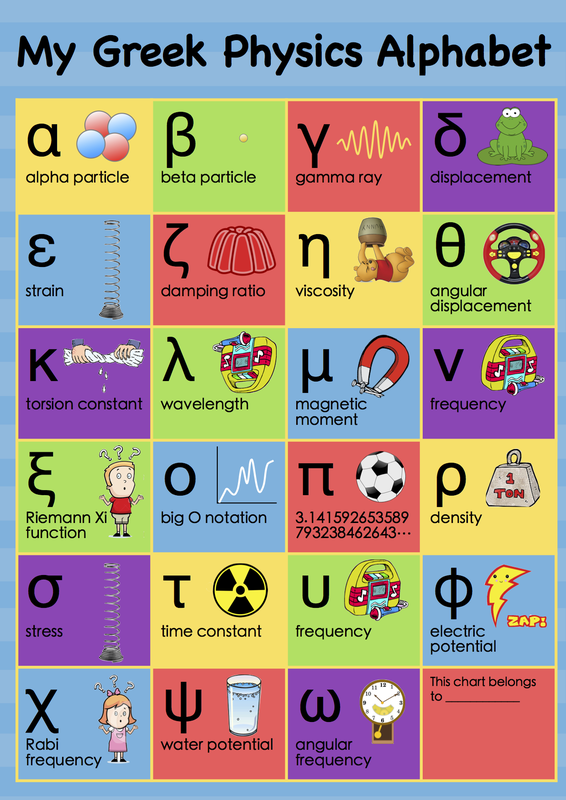 See the original poster, My First Physics Alphabet, here. In December 2012, I spat into a tube and sent it to 23andMe, a genetic testing company in California. In January 2013, they sent me the results of my genetic information over several days. I sifted through swathes of data and posted all the conclusions worth hearing onto my blog. There were 12 of them. As someone trained in biology, particularly in genetics, I knew how to interpret the genetic data. I knew to ignore all of the health information, especially the vague correlations in tiny studies with genes of unknown function, and posted only the inconsequential genes and the ancestral information instead. This wasn’t a privacy concern—I posted all the findings that I found genuinely interesting. But I did omit any findings that I knew to be total bunk. In one blatant statistical blunder, 23andMe told me I had a 1.5x greater chance than the “average person” of getting cleft lip. In another, they told me I had double the likelihood of getting certain diseases for which environmental factors were by far the greatest predictors. 23andMe doesn’t consider environmental factors and doesn’t differentiate between meaningful and meaningless statistics. People not trained in genetics or statistics wouldn’t have the same level of insight that I did. Some customers could read all the misleading data like numbers on a die, and then make false conclusions as a result. 23andMe never did enough to protect its customers from such confusion. In fact, they passively encouraged it with gimmicks like “Genetic Melody” and the inclusion of vague correlation studies in tiny populations for very serious diseases. This data could worry people unnecessarily. While 23andMe communicated science much better than did the average newspaper, there was still a gaping linguistic chasm between scientists and consumers. The way that 23andMe reported health information to the public was still in need of major improvement. But that improvement didn’t come quickly enough, and last week, the FDA shut down 23andMe’s entire genetic health reporting service. Its ancestry service lives on, which has always been 23andMe’s most interesting component in my opinion, and only new customers (after November 22, 2013) will be affected. Nevertheless, this decision is a huge blow for 23andMe and a momentous victory for advocates of science communication. Rightly so. The fact that so many people are typing (and I see you!) 23andMe scam into Google indicates that a problem is at foot. So while I’m pleased it’s been shut down, I also regret not making these shortcomings clearer in my 23andMe post one year ago. Despite the comments and emails I received from people trying to make sense of their 23andMe results, I forgot that not everyone is science-literate. Fortunately, the FDA remembered. Thank you. I care a great deal about colour and design. My revision notes always have a colour-scheme that makes sense to me, and I draw colour-coded character maps of the novels that I read (see examples in the “Popular Today” section on the right!). Information makes so much more sense to me in visual form. You can see some of those visualisations on the infographics section of by blog. That’s one of the reasons I loved this VCE Chemistry textbook. While it doesn’t say so explicitly, it’s noticeably designed for visual learners such as myself. First, I love the varied yet consistent use of fonts. The main text is set in Garamond on a white background, which makes it easy on the eyes when reading. 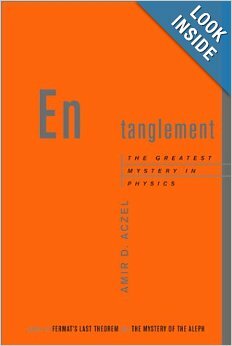 Titles, tables and questions are set in a tall, rare, old-fashioned sans-serif font on a colourful background, which gives this book its unmistakably unique appearance. Annotations and extra information is set in a neutral sans-serif font (similar to Helvetica) off to the side, usually in colour, and balances the old-fashioned feel of the other two fonts beautifully. The whole book is visually pleasing, which makes me want to spend longer looking at the pages! I also love the visual summaries at the end of each chapter. (This is where Heinemann—another VCE Chemistry textbook—falls down.) 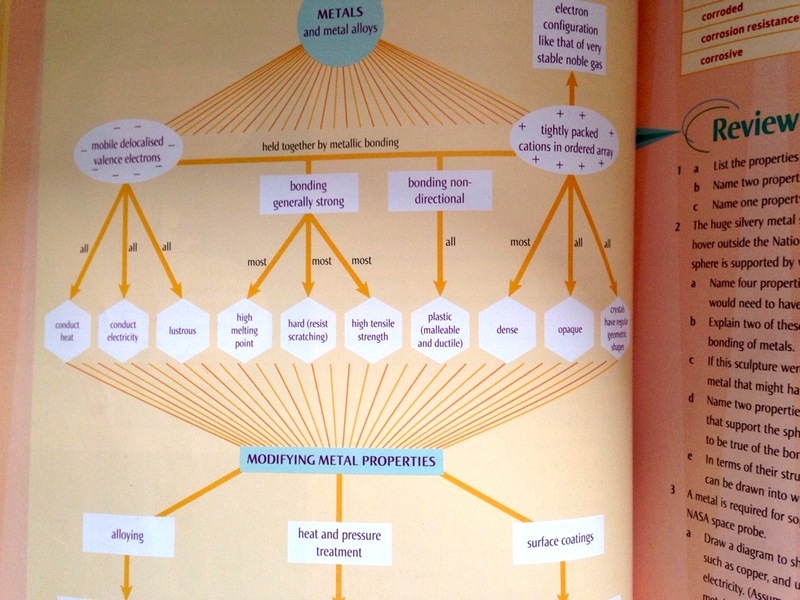 In particular, the visual summary on page 156 explains the properties of metallic bonding clearly and beautifully in one diagram. The diagram made a relatively complicated topic very simple to understand. I hope textbooks become more and more visual. Maybe with the introduction of the iPad in schools, colourful diagrams and interactive animations will become more common in the classroom. I hope so. I’m also not alone here. Many students I’ve taught in schools are actually averse to reading the main text in a textbook. They don’t even notice the Garamond—they only see the titles and diagrams. While we still need to focus heavily on improving literacy on the one hand, we also need to acknowledge this trend towards more visual ways of presenting information on the other. 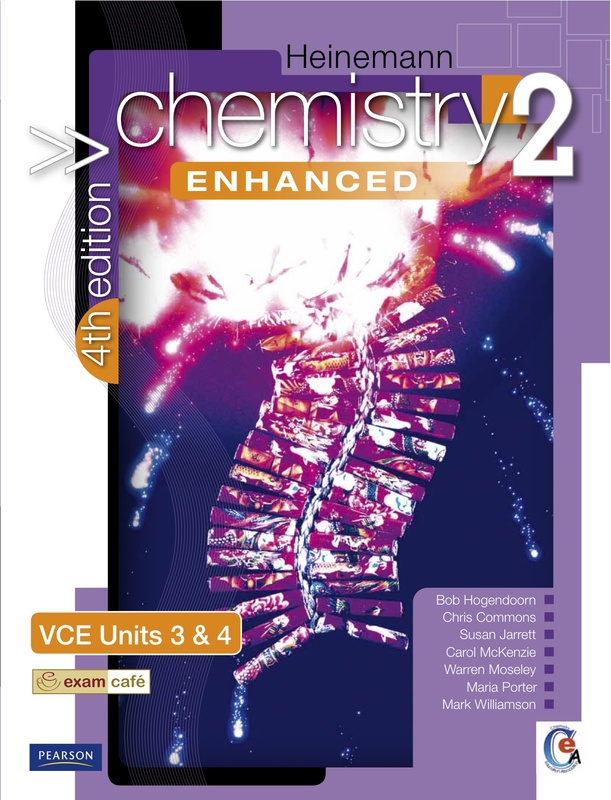 Heinemann Chemistry 2 Enhanced (Heinemann 2) is the best VCE Chemistry textbook in existence. There are two other major brands (Nelson and Jacaranda) but Heinemann 2 beats both of them in terms of comprehensiveness and clarity. 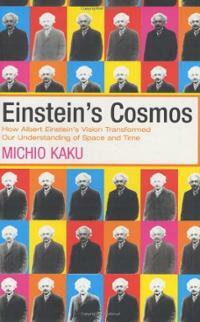 I read the whole book from start to finish in preparation for teaching VCE Chemistry. I love the clarity, the use of full colour and the connections to real life in this book. I also love how the most difficult unit, Unit 4, consists of hard and easy chapters in alternation! Left-brained chemical production processes are interspaced with right-brained “chemistry in society” chapters, which are easier to understand. 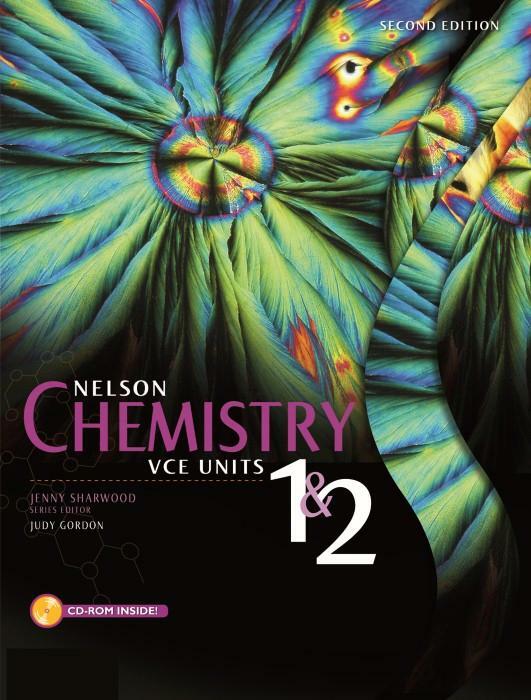 The whole book is organised according to the VCE Chemistry Study Design, too—and the Key Knowledge from the Study Design are pasted at the start of each chapter. 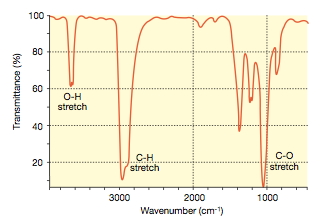 Why is the O-H stretch in Heinemann 2‘s spectrum so narrow and short? Page 445: the bottom paragraph on tin plating is very unclear. 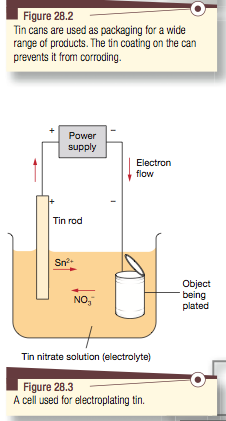 The book uses “tin” to refer both to the “tin can” and to the “tin plating”, even though only the latter is actually made of tin. An extract from Heinemann 2 is below. Just before Christmas, I spat into a plastic tube and sent it to 23andMe: a genetic testing company in California. 23andMe tests one million SNPs (minor changes) in a person’s genome, many of which are linked with known, inherited traits. Their results reveal a wealth of information about your health and ancestry, ranging from eye colour and bitter taste perception to the presence of major genetic diseases and your extended family tree. Meaningful results are then sent to you by email within a few weeks. All this is priced well-below cost, at just $99 plus shipping. It was totally worth it. 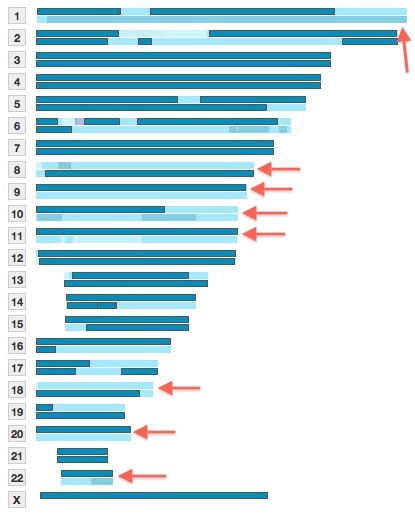 Here’s a list of the 12 most interesting things that 23andMe revealed about me. Fortunately, I carry none of the 48 diseases for which 23andMe tests. That’s good news! None of these diseases will affect me, nor will they be passed on to my children. This is awesome—I carry one copy of the HIV-resistance allele! A very small percentage of people are lucky enough to have this allele. The TAS2R38 gene encodes the receptor that detects PROP and related bitter plant compounds. I have a relatively common mutation that is insensitive to PROP. 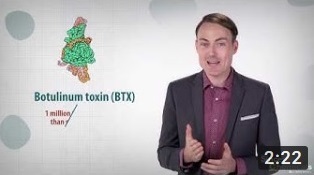 My version of this gene improves the taste of bitter foods—including poisonous ones. I don’t like milk, but at least I can digest it. I have two fully-funcional copies of the lactase enzyme, and both will remain active throughout adulthood. 5. Slow caffeine metabolism: CYP1A2. Caffeine is primarily metabolized by the liver enzyme cytochrome P450 1A2. My version of this enzyme metabolises caffeine slowly (just like 99% of people). I learned that I’m not one of the 1% of people who are virtually insensitive to caffeine. British and Irish: 67.6%; French and German: 5.8% (4 gen); Scandinavian: 0.1% (10 gen); Northern European: 24.0% (2 gen); Southern European: 1.2% (6 gen); Other European: 1.1% (7 gen); Middle Eastern/North African: 0.1% (10 gen); unknown: 0.1%. I calculated generations by taking the percentages, log base 2 and multiplying by -1. Most of my ancestors were from “Britain/Ireland”, or “North Europe”, which includes Britain and Ireland. But interestingly, there was a little more diversity than I expected. 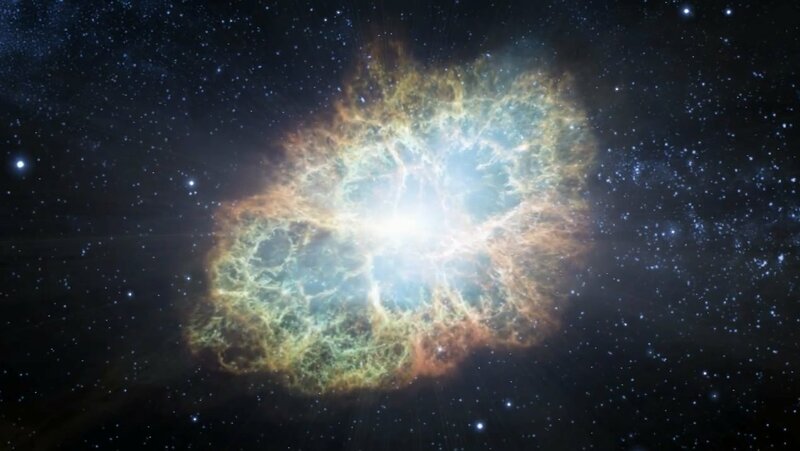 one of my (great-? )great-grandparents was either French or German (see number 11). Six generations ago, there was someone from South Europe in the family. Ten generations ago, there was one person from Scandinavia, and one person from the Middle East or North Africa. I already knew my blood group, but it was interesting to learn that blood groups are a complicated business. For everyday purposes, though, I’m an A-negative. Neanderthals looked like caricatures of Celts: white, brutish, red-haired and freckled. The average Caucasian has 2.5% neanderthal DNA, and I have 3.1%, putting me in the 98th percentile. It means that I’m “whiter” than most white people. H3 is a minority European haplotype found in Western Europe. (Most natives are H1 haplotype.) Over the last 10,000 years, H3 declined in Europe due to random genetic drift, but remains prevalent today in the Basque region (probably because they mixed less frequently with outsiders). There’s almost no phenotypic difference between H1 and H3, so until further research is done, this is merely an interesting fact. Obviously. My paternal family is Irish and my paternal haplotype proves it. R1b1b2a1a2f2 is distinctively Irish. This is very interesting. I’m British, so while having a little French/German DNA is normal, having it all on one arm of one chromosome indicates that it probably all came from one, recent ancestor (no more than 4 generations ago). Given that French/German DNA is unique in going mostly undetected using 23andMe’s testing methods, and that the possibility of inheriting an entire chromosomal arm halves with each generation, this French/German ancestor was probably a great-grandparent. I didn’t know this. 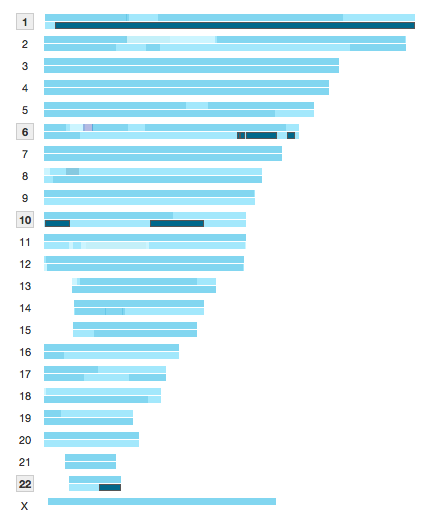 My French/German DNA (dark blue) is mostly on one chromosome. 12. Eight chromosomes contain one arm with no British/Irish DNA at all. Chromosomes 1, 8, 9, 10, 11, 18, 20, and 22 contain one arm with no British/Irish DNA at all, and one arm with almost 100% British/Irish DNA. Given that one arm is inherited from each parent, this indicates that either I (or each of my parents) had one parent who was purely British/Irish, and one who was a more mixed “Northern European”. Eight chromosomes have one arm with no British/Irish DNA (dark blue) at all. 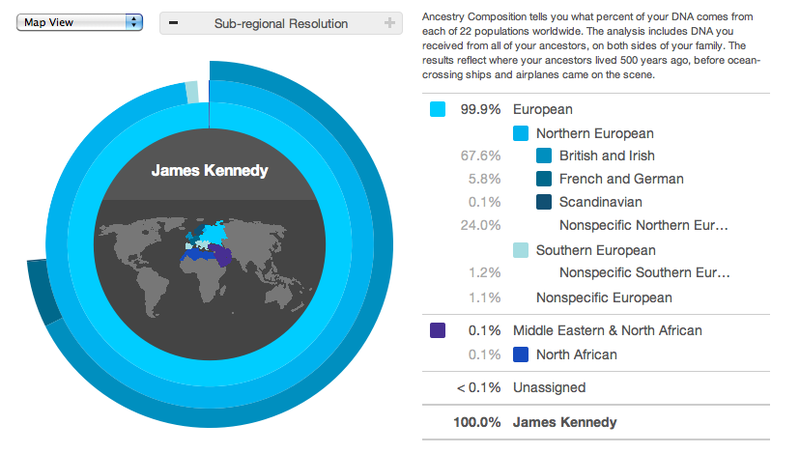 This indicates one recent family member of mixed, Northern European origin, not just from Britain and Ireland. Additionally, 23andMe found 833 distant cousins who have also had their DNA tested. I share great-great-grandparents with the closest of these cousins, but none of them have surnames that I recognise. Some of them live in Wales, but that’s probably just a coincidence. The process of trying to link the family trees, if I do it, would be a long one. I wanted to do this years ago, but it used to be too expensive: $999 plus a monthly subscription (whatever for?) The price then dropped to $499, $299 then $249 (last year), before finally hitting $99 before Christmas 2012—without any monthly fees. That final price drop prompted me (and nearly a million others) to buy the test. I highly recommend 23andMe. The data arrives little by little, so there’s something to look into (and reference papers to read) each day. Anyone interested in their own health or ancestry should give it a go.